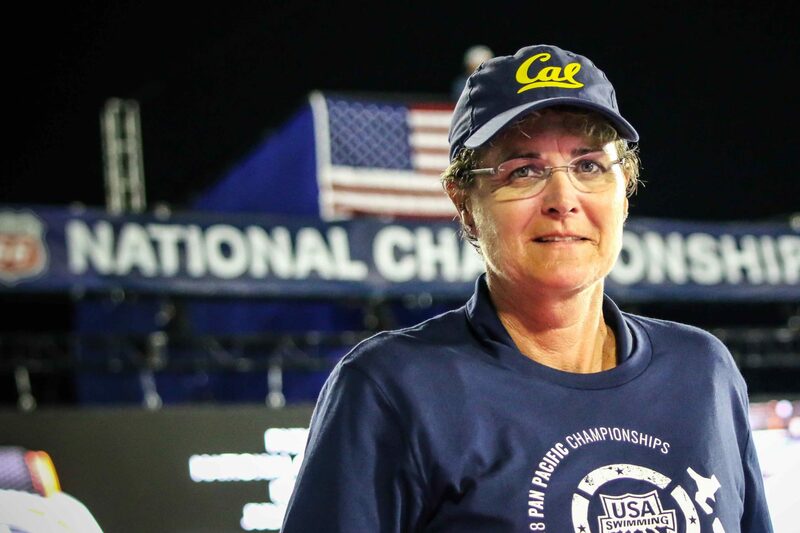 "The city of Irvine, California has been abuzz with excitement this past week as the national championships have splashed into action. Next week, the action will continue as the 2018 Speedo Junior National Championships get underway. The psych sheet was recently released and features many rising stars, who will be competing during the five day meet." Our Dutch Bear Robin anchored NED's Mixed 4x200m Free relay with a 1:59.83 for a team finish of 5th in the finals session. Not certain what Marina's personal record is for the 100 Breast in LCM (think she went a 1:07.97 @ Kazan 2015, and was 1:07.58 at this year's Mediterranean Games), but she laid down a swift 1:07.48 in the semis of Euros to qualify for tomorrow's final in the 6th seeded spot. Excited to see if Marina can drop her time further in finals, and how she will fare at her better event (200m Breast) on Monday. Marina shined in 2012 and in 2013 and, after 4 years in the United States, where she made a fruitful combination of studies and technical improvements, she has once again taken full advantage of her return to Spain. Marina had taken a courageous step: she decided to combine studies and swimming with a scholarship at the University of Berkeley in the United States. She betted on studying. She faced four years focussed more on technical improvements than on short-term results. "The biggest difference is that I'm not studying anymore because I've graduated. I am also back in my country and there are many changes with respect to the United States. Life there is difficult when you are a foreigner, but I have learned many things at Cal, both personally and as an athlete. It is something that I will always carry with me and I am very grateful. I would not change it for anything", she says of that stay on the other side of the pond that has made so much of a mark on her. That personal growth has been transformed into growth in the pool on her return to Spain. Marina is the third fastest European and the best Spanish swimmer in this year's Women's 200m Breast rankings thanks to a spectacular performance a few days ago in the Spanish Summer Championship, where with 2:23.36 she achieved the second best mark of her life (her best is a 2:22.88 from that 2013 World Cup in Barcelona). Robin (aka "Rob"/"Robiloks"?? ) is through to semis with her 1:59.91 in the 200m Free. -> Marina places 6th in the 100m Breastfinal, with a 1:07.55. Dead last at the halfway mark by quite a bit, then stormed back ahead of two of her competitors. 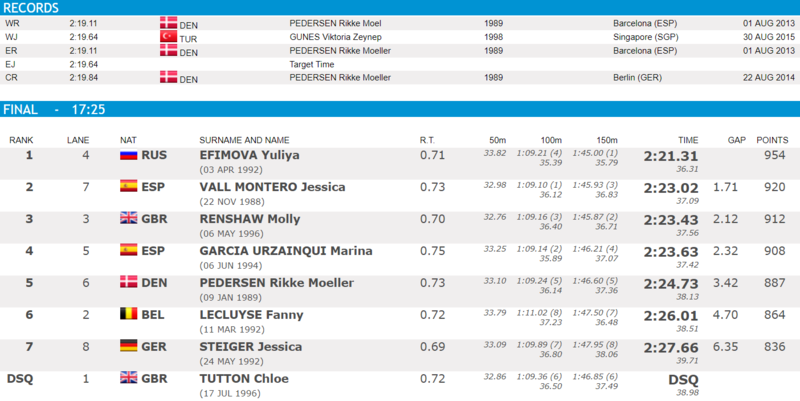 -> Robin ends up 13th with her 2:00.39 in the semis of the 200m Free. -> Marina is the #2 seeded qualifier behind Efimova for tomorrow's 200m Breast finals, after busting out a 2:24.31 in the semis! -> Marina just off the 200m Breast podium by 0.2 sec, places 4th with a 2:23.63, more than a sec ahead of 5th place finisher and WR holder Rikke Moeller Pedersen. -> Robin led off for Team NED, helping her teammates to finish 6th in the 4x200m Free Relay. Congrats to Team Captain Izzy @ Jr Pan Pacs! Another reminder that two swimmers can qualify for each final (A & B), and that they can enter in as many events as they want, though they'll probably end up scratching some, as some of these recruits have hefty event loads, as of now. 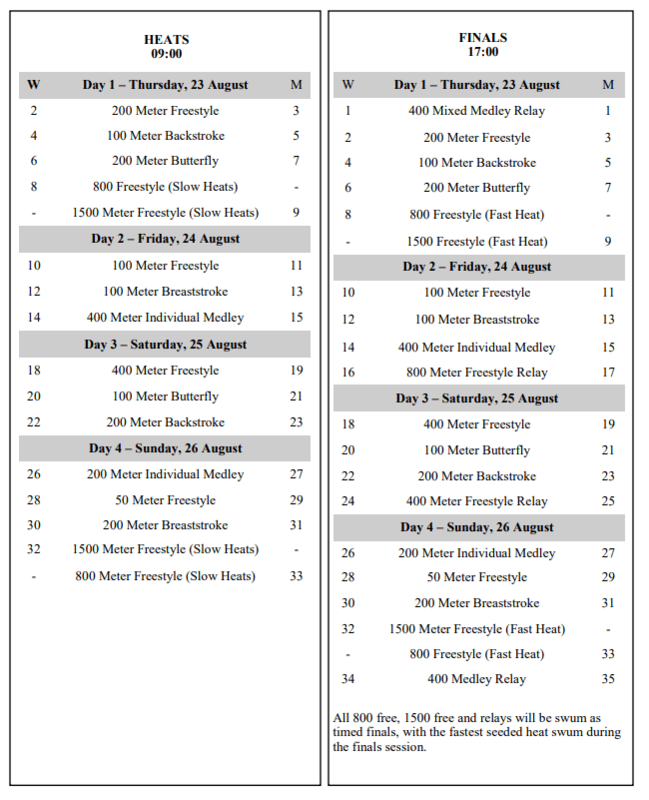 *note: assuming the top 4 USA seeds make the free relays, and the top seed in each stroke's 100 for the medley relay. 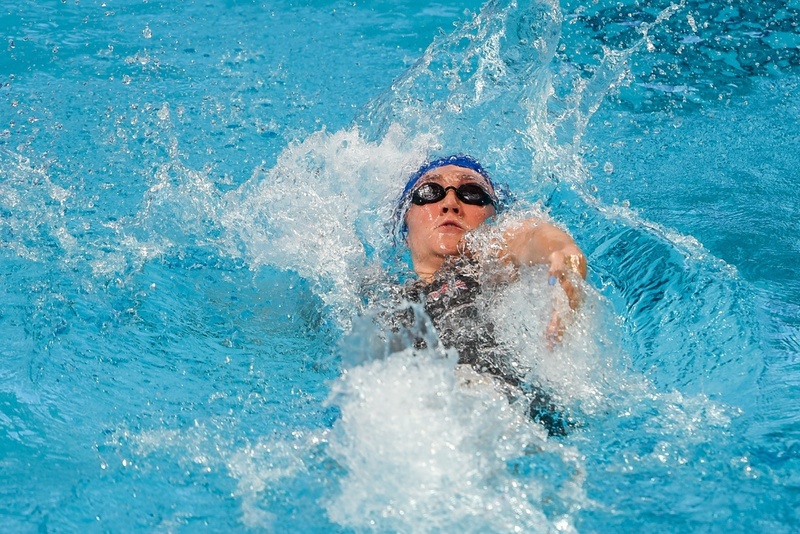 Ivey, Kibler, Nordmann, and Roy are each swimming in their 2nd, and last, Jr. Pan Pacific Championship meet, while Bacon, who is entering her junior year of high school, will be age-eligible for the 2020 meet. The 4 returning swimmers combined for 7 gold, 2 silver, and 3 bronze medals at the 2016 meet, led by 4 golds and a bronze from Ivey. 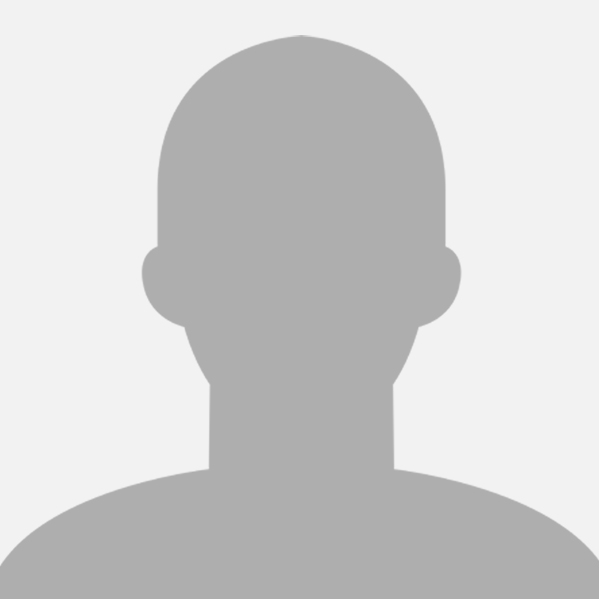 To watch Jr Pan Pacs, they should be streaming it here. Only the top 4 get to swim in finals, so it'll be a battle during prelims for the USA swimmers. Heat 3 should feature Izzy in the middle lane, with heat 4 with 2021 recruit Gretchen Walsh, along with 2020 recruit (swimming for Ecuador, interesting), Anicka Delgado. Heat 5 will feature the top seed, Claire Tuggle, in lane 4. Lots of racing in the 200 free heats, with Jake Magahey swimming in the center of heat 3, and both Destin Lasco and Dare Rose in heat 4. The 100 back will be an interesting race to watch, with Katharine Berkoff in heat 3, battling 2018 LSJU commit Lucie Nordmann, with Alex Walsh, Phoebe Bacon, and Isabelle Stadden in lanes 3-5 of heat 4, along with Maxine Parker in lane 1. Men's 100 back will also be interesting to see who will make the A final, with Destin Lasco and Tim Connery in heat 4 trying to beat out UT commit Peter Larson for the A final. The other Nordmann sister, Lillie, will try to beat the three 2018 commits to make it into the A final from heat 2. Gianluca Urlando will try his hand at Michael Phelps's 15-16 NAG record, and see if he can beat current bear Andrew Seliskar's meet record of 1:55.92 in heat 2, also featuring 2020 recruit Ethan Heasley. In heat 1, Mariah Denigan and Emma Weyant will battle it out, and Lola Mull will be out in heat 3, with the boys swimming in between. Gretchen Walsh 2:01.4 to place 3rd in the 4th heat. Claire Tuggle 1:59.36 to win the final heat. Tuggle & Ivey should make A final, Walsh & Zoie Hartman for the B final. Looks like the relay is going to be Ivey, Walsh, Hartman, and Tuggle, in that order (2nd, 3rd, 4th, 1st), unless they decide to add Nordmann. Bacon first in a sizzling (lol) 59.72, with Alex coming in at second in 1:00.56, and Isabelle in third in 1:00.60. Rough for Stadden, as she won't be making any final, and getting outtouched by just 0.04. Nordmann & Berkoff swim off to see who makes the A final. Men's 200 free - Magahey qualifies second behind Kibler in 1:48.65, with Dare Rose also qualifying for the B Final in 1:49.65. Think the 800 FR will be Magahey, C.Foster, Rose, Kibler. M 100 back: Destin Lasco (55.57) & Adam Chaney (55.89) qualify 1-2 for A final, Tim Connery in the B final. Claire Tuggle was a 1:58.58 to win the 200 free, with Izzy placing 4th in 1:59.46. Gretchen Walsh was 2:01.99 for 4th in the B final. In the men's 200 free, Jake Magahey just missed Dressel's NAG with a 1:48.67, showing remarkable consistency to place second. Ethan Heasley was 1:51.52 to place third in the B final. Bacon matched her time from the preliminaries to win in 59.72, with Berkoff placing second in 1:00.16. Alex Walsh was 1:00.23 to have the third fastest time overall and win the B final. Destin Lasco & Adam Chaney, both 2020 recruits, placed 1-2 in the backstroke with times of 55.75 and 56.18, respectively. Tim Connery was 55.93 for the third fastest overall time. In the 200 fly, Lillie Nordmann placed 4th with 2:12.08, and Urlando was just off Phelps's NAG with a 1:56.25. Denigan & Weyant placed 2-3 in the 800 free, just off their seed times. In the mixed medley relay, Bacon lead off the A relay with a 1:00.44. Urlando had the fastest fly split in 52.11, and G.Walsh brought it home in a fast 53.78. In the B relay, Izzy finished off the third fastest relay overall in 55.80. 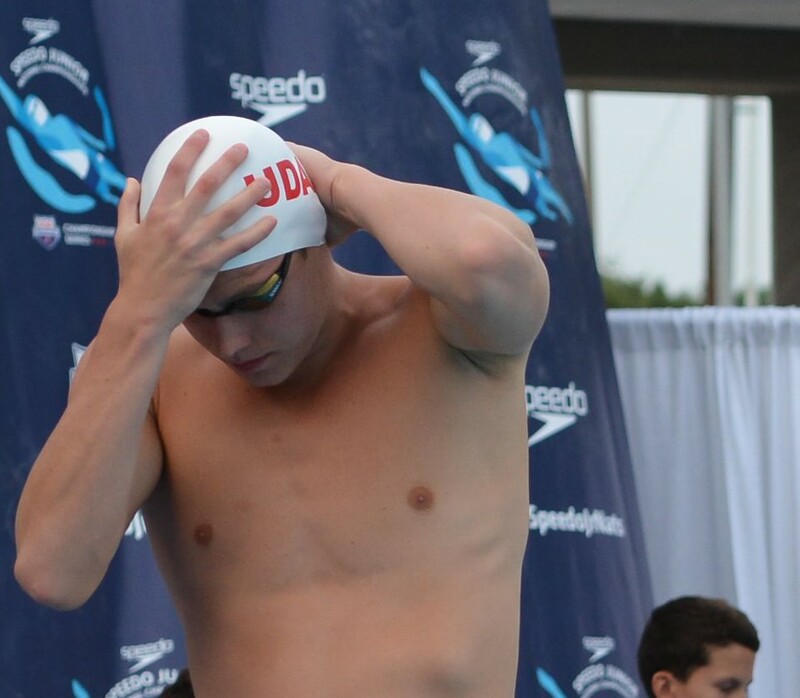 - Urlando apparently went 4:18 mid to qualify for A final of 400 IM over Jake Foster, but was DQed. On the run so 'fraid this isn't going to be one of those super duper recaps in the bearz012 mode lol - just wanted to congratulate 2019 Baby Bear Izzy Ivey on her pivotal role in helping Team USA to smash the Jr Pan Pacs record in the Women's 4 x 200m Free Relay ! Izzie had earlier on in the session won the 100m Free 'B' final, with top seed Alex Walsh (2020 recruit) claiming the runner-up spot. The 2018 edition included two veterans and captains, Ivey and Nordmann, plus two swimmers in Tuggle and Walsh that are among the youngest on the squad and who will be eligible to carry the torch forward in 2020 (if they haven't made 'the big team' by then). Both meet records fell in the 4200 free relays to close day 2 of the 2018 Junior Pan Pacific Championships. The U.S. relays won both boys and girls golds, taking down Junior Pan Pacs records that had stood since the super-suit era of 2009. On the women's side, a very young quartet went 7:57.93, taking three tenths off the meet record. The team was remarkably consistent, with all four legs between 1:59.1 and 1:59.7. They were also the only relay in the field to have all four legs under two minutes. 14-year-old Claire Tuggle led off in 1:59.32, followed by a 1:59.73 from 17-year-old Isabel Ivey, a 1:59.72 from 15-year-old Gretchen Walsh and a 1:59.16 anchor from 18-year-old Lucie Nordmann. Their time cracked the 7:58.26 meet record set in 2009 by a relay featuring future U.S. National Teamers Dagny Knutson and Catherine Breed. - Emma Weyant won the 400 IM in a 4:40.64, just about a second & a half off from the WJR! Mariah Denigan was not far off as well, with a 4:41.3, way ahead of third place. - From the B Final of the 800 FR, Alex Walsh was a solid 2:00.79 to lead off. That would've been top 4 in Americans for the individual 200 free. - Isabelle Stadden rocked an impressive 2:08.81 in the 200 back to break the Meet Record set by 2018 LSJU commit Lucie Nordmann. Kat Berkoff made the A final behind her in a 2:11.01, with Nordmann & Alex Walsh in the B final. - Mariah Denigan & Claire Tuggle were 3 & 4 in prelims of the 400 free, with times of 4:13.49 & 4:13.55, respectively. Weyant & Mull will be in the B final tonight. - Ethan Heasley was a 3:55.14 to qualify second for the A final of the 400 free, with Magahey & Rose in the B final. - Urlando posted a 52.56, just off his PB to qualify first in the 100 fly. Isabelle with the nice comeback in the 200 Back after a heart breaking 100 Back. She and Alex Walsh are my two favorite recruits for the class of 2020. Izzy on the podium with her *bronze* in the W 100m Fly. Only American to dip below the minute barrier at this meet. - Alex Walsh qualified first in the 200 IM in 2:14.44, with Claire Tuggle in the B final in 2:16.40. Bacon was 2:18.01, Stadden was 2:18.64, and Weyant was 2:19.98. Izzy & Berkoff scratched. - Urlando was 2:01.42 to qualify first ahead of Carson Foster. - Maxine Parker and Gretchen Walsh qualified 2-3 in the 50, with times of 25.73, and 25.80 respectively. Parker is only 0.01 behind the first place qualifier, Natasha Ramsden, of Australia. Izzy was 26.61 to qualify 4th out of the B final. Stadden, just out of the 200 IM, was 26.88, and Berkoff was a 26.90. - Adam Chaney was a 23.16 to qualify 4th for the final. Lasco was a 23.47 to qualify first in the B final. Kathleen Baker used a second-half surge to win the 100 backstroke, earning her first World Cup victory. The U.S. swimmer was behind Kira Toussaint at the turn but moved ahead down the stretch to win in 55.91. The host Netherlands closed the second day of the Eindhoven World Cup stop with a victory in the 4400 free relay. The U.S. team of Michael Andrew, Blake Pieroni, Kathleen Baker and Kelsi Dahlia finished second in 1:30.88. Just carrying on Natalie's legacy, courtesy of "Backstroke U"
COLORADO SPRINGS, Colo. - USA Swimming today finalized a decorated 35-swimmer lineup for the 2018 FINA World Swimming Championships (25m), set for Dec. 11-16 in Hangzhou, China. NBC will provide live coverage from the Dec. 11-16 event daily via the Olympic Channel from 7-9 a.m. EST. 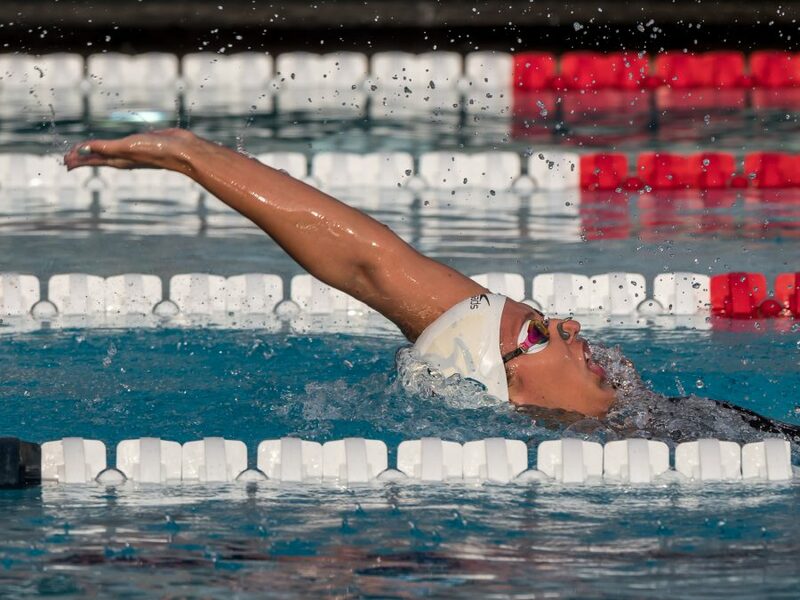 On the first day of the 2018 Swim Meeting in Bolzano, American Kathleen Baker fired off a new meet record in the women's 100m backstroke. 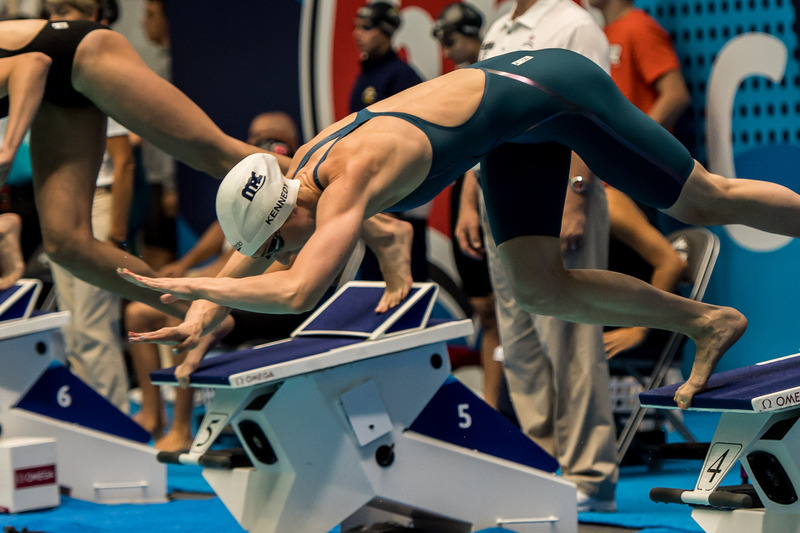 Stopping the clock at 56.85, the American Record holder in this short course meters event won by 2 seconds over Italian racer Margherita Panziera, who clinched silver in 58.88. American Ali DeLoof rounded out the top 3 in this timed final in 59.95. For Baker, this performance is coming off her newly-minted American Record of 55.91 set back in September of this year at the World Cup stop in Eindhoven. 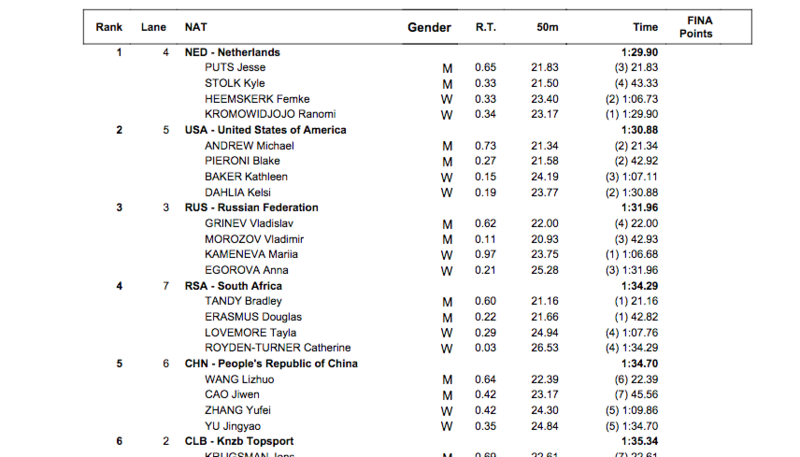 The previous meet record here in Bolzano was set at 58.16 by Dutch swimmer Kira Toussaint last year. Baker was back in the pool in the women's 100m IM, representing the only racer under 1:00 tonight. 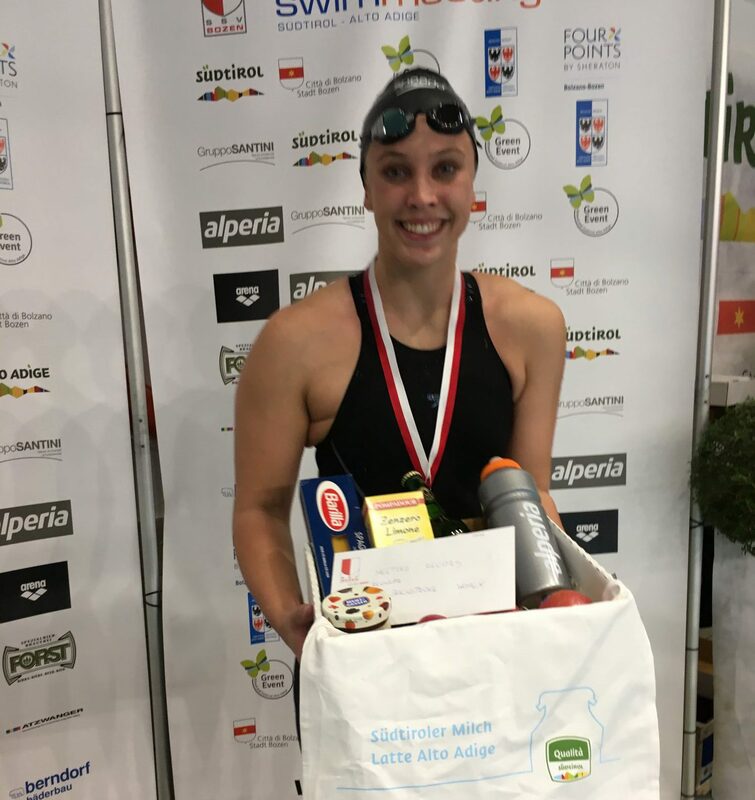 She earned the gold in 59.35, while Laura Letrari of Italy and Hungary's Evelyn Verraszto also made it onto the podium with silver and bronze in respective times of 1:01.97 and 1:02.37. Dahlia set another meet record en route to the top of the podium in the women's 100m freestyle tonight as well. Team Elite member Madison Kennedy registered 54.22 for silver, while Erika Ferraioli scored bronze with a mark of 54.32. 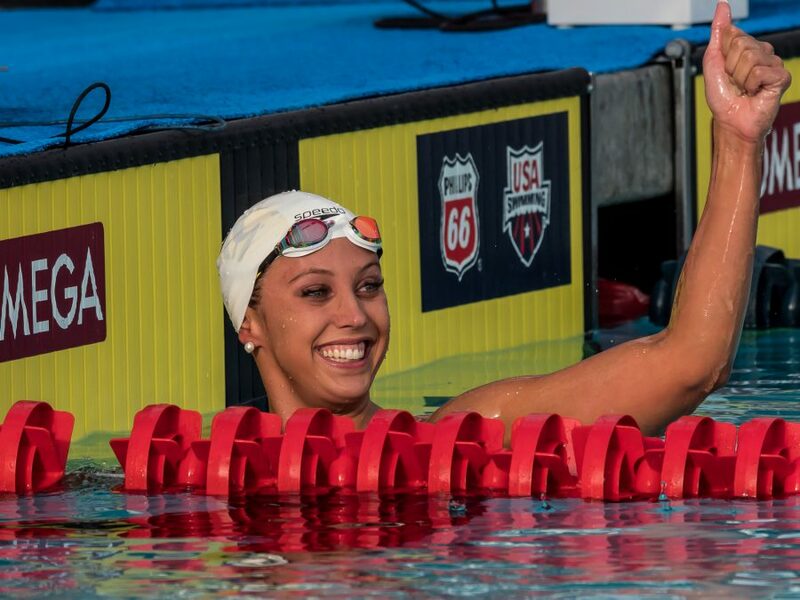 Newly-minted meet record setter from yesterday's 100m back race, Kathleen Baker of the United States was back to her winning ways this evening, taking the 50m backstroke sprint. 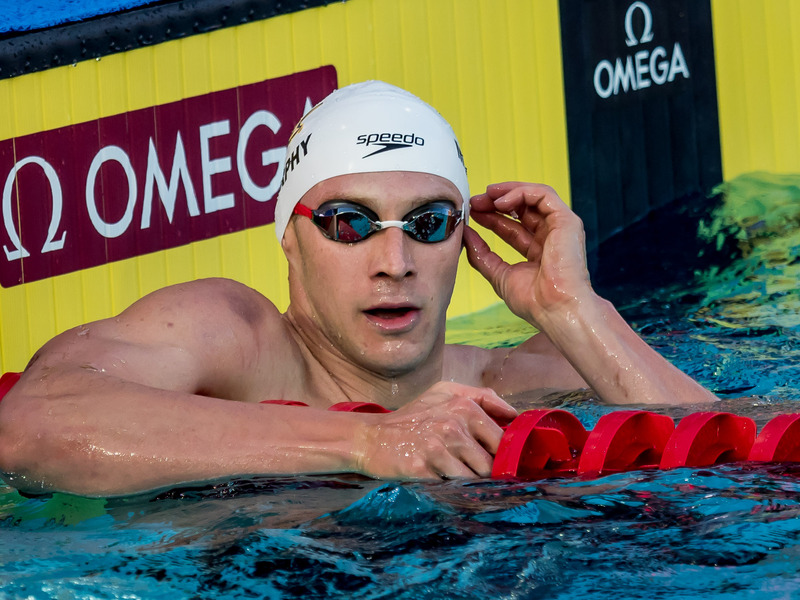 Hitting the wall in 27.54, Baker represented the only swimmer of the field to delve under the 28-second threshold. Italian Margherita Panziera finished in 28.03 for silver, while American Record holder in this event, Ali DeLoof, took bronze in 28.23. Baker was back in the pool a short time later to contest the 100m breaststroke final. She performed with a solid 1:07.49 for bronze, while Martina Carraro and Maria Romanchuk surged to the wall ahead of the American. 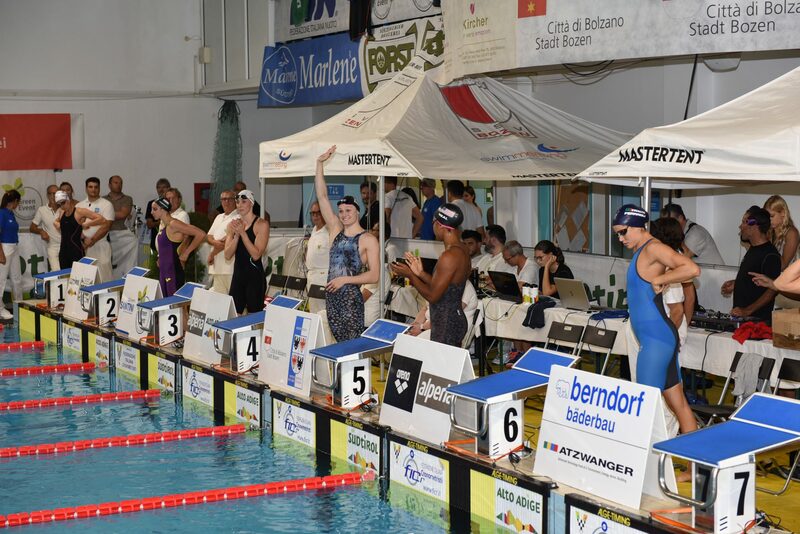 Although the meet record remained in tact in Dahlia's next event, the women's 100m free, the sprinter nailed another gold, registering a mark of 52.56 to stay ahead of a charging Italian in Federica Pellegrini. Dahlia opened in 25.40 to Pellegrini's 25.75, but the Italian turned up her closing speed to finish in 26.95 to Dahlia's 27.16. Pellegrini settled for silver in a time of 52.70, while Madison Kennedy of the stars n' stripes got on the board for 3rd in 53.69. Dahlia wasn't the only American to win 2 golds, as reigning 100m backstroke world record holder Kathleen Baker snagged a pair for herself. Baker crushed the only sub-1:00 100m IM time of the field to top the podium in 59.74, a new meet record, before taking the 100m back in 57.34. 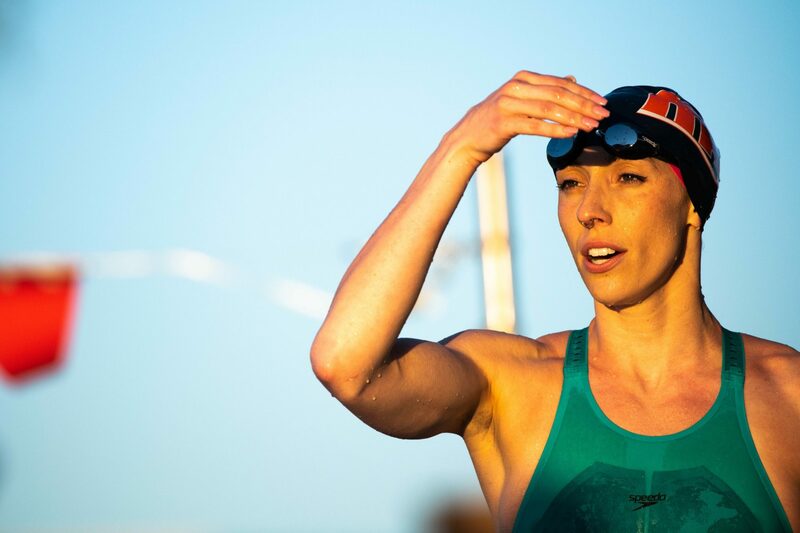 For perspective, Baker's season-best in the 100m back is the 55.91 earned at the World Cup in Eindhoven and that mark remains #2 in the world only behind Aussie Emily Seebohm. Team USA landed in Hangzhou, China for the 2018 Short Course World Championships five days ago, giving them nearly twice as much time to adjust to the time zone as the 2018 Pan Pacs team had in Tokyo last summer. 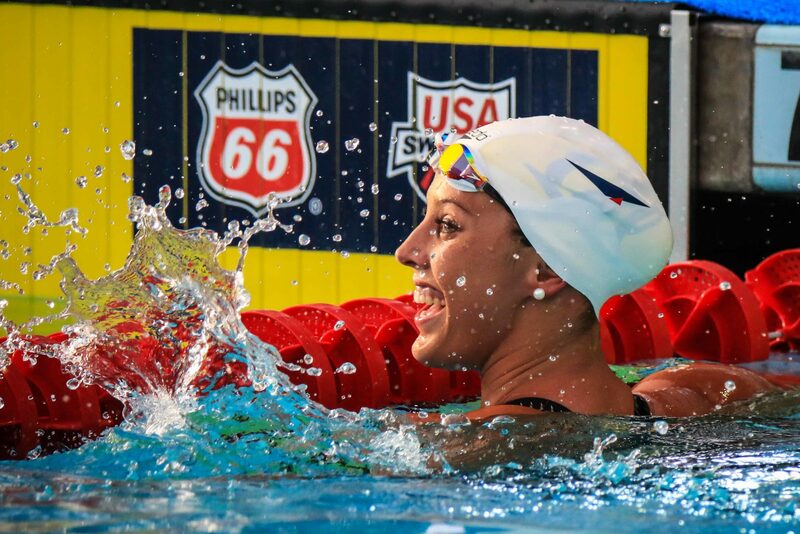 USA Swimming has assembled one of strongest teams in recent history to compete at SC Worlds. This one is actually a lot closer than it appears, with a spirited battle between the two recently-announced 2020 Olympic head coaches for Team USA - Cal's Dave Durden and Stanford's Greg Meehan. 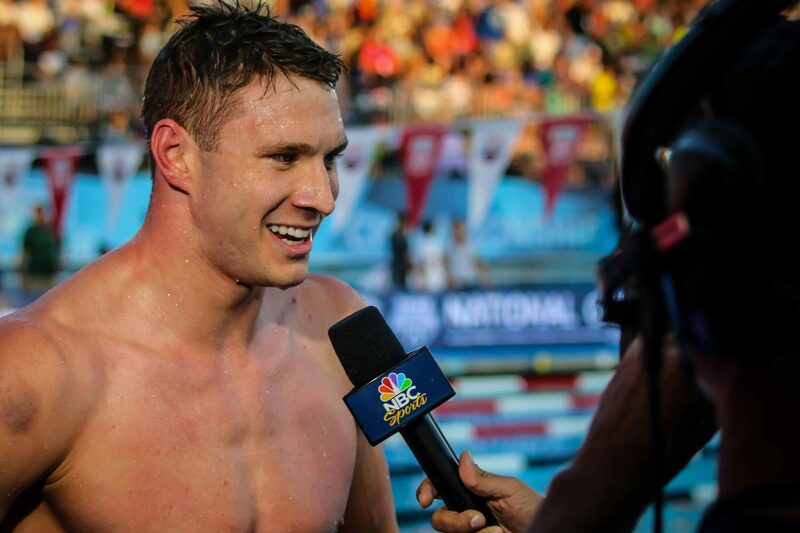 Durden gets the slight edge, though, capping off a Swammy awards that saw the California Aquatics program earn U.S. Swimmer of the Year, the U.S.'s only Breakout Swimmer of the Year honorable mention and the U.S. Coach of the Year award. 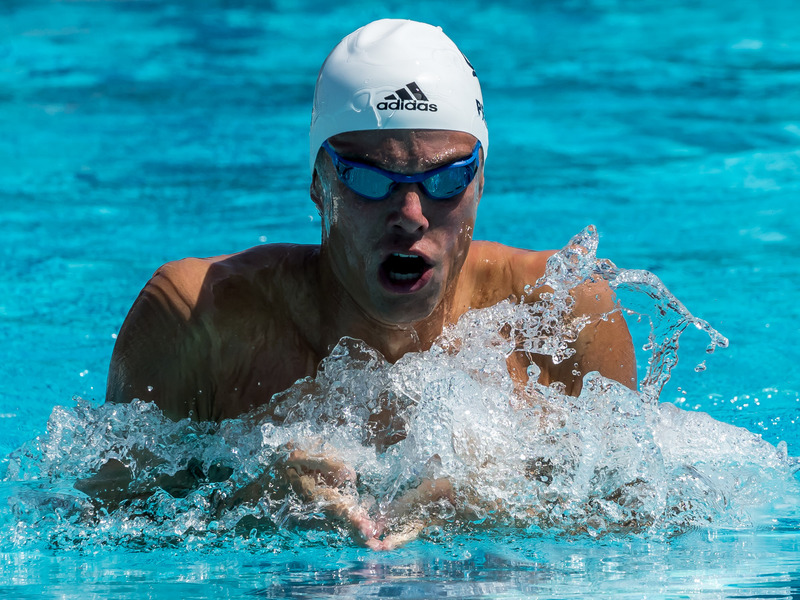 Durden's men won two individual and three relay gold medals at the 2018 Pan Pacific Championships, including a backstroke sweep from Ryan Murphy. 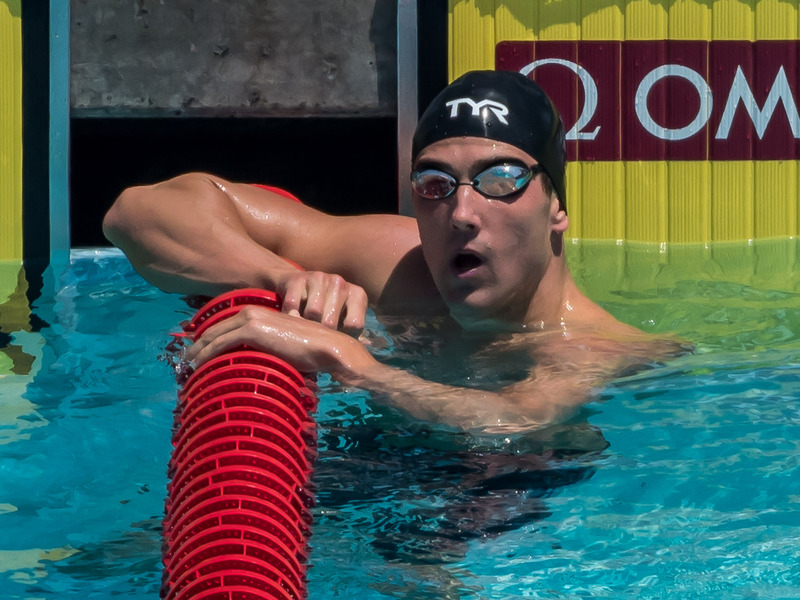 Breakout star Andrew Seliskar added a silver medal individually, and Murphy, Seliskar and Nathan Adrian all swam on winning relays. In addition, a much-talked-about summer for the Cal men saw Golden Bears spread across USA Swimming's upcoming international travel rosters. 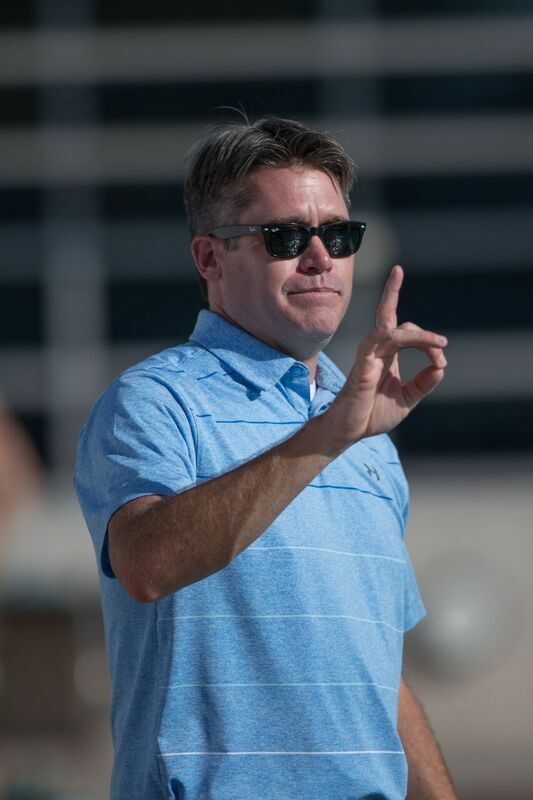 Durden put six men on the 2018 Pan Pacs team (Murphy, Adrian, Seliskar, Josh Prenot, Jacob Pebley and Sean Grieshop), five on the 2019 World Champs team (Adrian, Seliskar, Murphy, Prenot and Pebley), six on the 2019 World University Games team (Grieshop, Connor Hoppe, Michael Jensen, Trenton Julian, Bryce Mefford and Nick Norman) and four more on the 2019 U.S. Pan American Games team (Adrian, Daniel Carr, Matthew Josa and Tom Shields). All fourteen of those men qualified out of this summer's U.S. Nationals. Prior to the passing of Jim Wood, USA Swimming's National Team Steering Committee had elected Teri McKeever as its chair and representative on USA Swimming's Board of Directors. USA Swimming says that change was made in November. McKeever becomes the first woman in USA Swimming history to hold the title of chair with the National Team Steering Committee. The steering committee is a collection of mostly coach and athlete representatives who oversee USA Swimming's National Team program. Meehan and Durden make the committee both for being the 2017 World Championships head coaches as well as the newly-named 2020 Olympic head coaches.